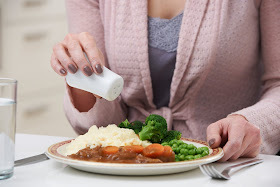 You don't have to add salt to your food to eat too much of it – around 75% of the salt we eat is already in everyday foods such as bread, breakfast cereal and ready meals. So, eating too much salt can cause high blood pressure. Follow these tips shared by Jumia Food to cut the salt in your food and reduce your salt intake. In some restaurants, you will find salt shakers on every table. So, if you need more salt in your food, you can simply make use of the salt-shaker. So, don't use salt at the table. Salty food is an acquired taste and after a few weeks of not salting your food, you will get used to the natural flavours of food and not miss the extra salt. Check the nutrition facts labels on foods to determine which options have the least salt. Products labelled salt-free, sodium-free, very low sodium or low sodium are good options. While most foods naturally contain small amounts of salt, the majority of the salt consumed by some people are from processed foods. Salt adds flavour and helps preserve processed foods so they stay fresh for longer. Purchasing less processed foods will help you limit your salt consumption. When ordering your food, request that the restaurant add little or no salt and that any sauces or dressings be served on the side since these often contain high amounts of salt. Then you can use just a small amount on your food for taste. Cooking using whole fresh or frozen foods limits the salt since you can avoid adding salt and the only sodium present is that naturally found in the food, which is typically very small. Brown rice and baked potatoes are good examples of whole foods.